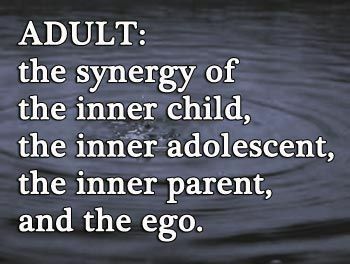 You become an adult when you integrate with the various parts of you. You have an inner child. You have an inner adolescent. You have an inner parent. These four are mandatory of all humans in today’s world, as far as I know. These parts live and breathe and think and feel, inside of you. They exert profound influence in your life right now, today. So let me ask you: which of those parts dominates your life right now? Do you function from ego, or child? Or is it the adolescent? If you’re like most people, you fall under one of those three categories, when it comes to how you interact with your world and with your life. Whose eyes are you seeing the world though, right now? Or maybe you’re one of those rare individuals who’s integrated with these other parts of yourself. In which case, you’re an adult. You function as an adult. Congratulations. Pretty sweet, isn’t it? Life flows so much better when you function as an adult. But what if you sense you’re not quite there yet? What’s it gonna take to truly function as an adult, in a grown-up world? Having the balls to say WTF. Why am I alive, if not to go for it? There was a time when I wanted to die. I mean, REALLY wanted to die. But I was scared to death to live. What kind of life is that? I didn’t come here to live the life of a coward, and then die. I’m going to go for that inner place inside that scares me. I’m not going to go through life, and never face myself. I’m just not going to do it. Yes, there’s something inside me I’m afraid to face. I’ll admit it. But someday I will face it. It’s inevitable. And intuitively, I know it’s better to face it while I’m still down here on earth. I don’t know how I know it, but I do know that I know it. Becoming an adult. It sounds so simple. All you gotta do is grow up. Be responsible. Live a life you don’t want to live. That’s what an adult is, right? A miserable person trudging through life? Not in my book. Being an adult means taking a stand for yourself. I will stand up for me. And I will not stand for anything or anyone that doesn’t respect me. I will not stand for it. That’s what being an adult means to me. It also means I’ve integrated with the other parts of me. At least to a certain extent. I’ve integrated enough. Sure, there’s always more to do. But I’m at peace with myself. And I can work things out amicably in my head… and in my heart. We’re a team, so to speak. We’re enough of a team, anyway. We’re close enough. Me and the other parts of me. I’ve helped them heal enough of their fears so it’s not in my face any longer. I might feel fear, but it’s not a morbid fear, like it used to be. I’m okay with the fear I feel. That’s another characteristic of an adult. Ironically, you don’t get there by working harder, by trying harder. You get there by engaging ‘process’. You engage the magic of process. Which really means you step into the flow of life. Life is a process. When you let life be what it is, you start finding yourself in the flow. All life is a process. All life is a flow. And those don’t have to be words of platitude…. something that sounds good, but with little substance…with nothing to sink your teeth into. No. As an adult, you feel the flow of the process of life. And you relish in it. Life holds meaning and significance, and so much juicy, wonderful mystery. The mystery of life becomes a source of joy. As an adult, you’re glad to be alive. You realize the honor and the privilege of the gift of life. You don’t take it lightly, this gift of life. You’re grateful for this very short time on earth. You’re glad to be alive. As an adult, you’re in charge of your own little domain. You have dominion over yourself. And it spills out into your world. Your dominion changes the world. As an adult, you realize you can’t do it all by yourself. You just can’t do it. You need help from the ‘higher parts’ of you. You admit to yourself you can’t do it by yourself. As an adult, you accept yourself. You know you’re not perfect You know what you want to change about yourself. But you also know if you won’t accept your imperfections, your foibles, your mistakes… if you won’t own your humanness, then you can’t change. If you won’t accept yourself the way you are, then you have nothing to grab hold of and change. Adults accept themselves. As an adult, you see yourself as an adult. You hold the image of ‘adult-ness’. Your self image, your identity, your anchor of who you are – all reflects an energy that could best be described as ‘adult energy’. As an adult, you have the resonance of an adult. You give off the vibe of being an adult. Other people somehow sort of pick it up about you. And you know it too. That’s what it’s like being an adult. As opposed to, say, being a scared little child who’s living in a great big scary world. It’s hard to make it in a grown-up world when you’re functioning as a child. Real hard. Life will always be scary. Coping will always be challenging. Winning will always be elusive. The urge to hide under the covers never really goes away. As an adult, you’re in touch with your value. You don’t have to question it. You feel it. You know it. You trust it. Your value will not desert you. It’s rock solid. And it’s endless. As an adult, your value never ends. You don’t run out of value. It’s always there. It’s a part of you. As an adult, you are loved. You let yourself be loved. The forces, the powers, the entities who love you are endless. As an adult, you know you will never know how deeply you are loved. And that’s okay. But what fun you will have, plumbing the depths of that love! As an adult, adventures await. Curiosity abounds. Life feels exciting… interesting… fascinating. Life holds intrigue behind every twist and turn. You don’t have time to be bored. And if you do, you love that boredom while it lasts. Even boredom becomes delightful. As an adult, you have no need to manipulate or control the people and events you see around you. You know what you see is not real. Not really. It’s a reflection of a more-real reality. As an adult, you know everything you see in the world amounts to only feedback. It’s showing you your own beliefs and attitudes, your own thoughts and feelings, your own choices and decisions. You may not like that feedback, but you accept it is feedback. As an adult, overall, life is good. Not perfect. But good enough. Yes, it could be better. Yes, there’s this, that, and the other you’d like to change. And, you probably will, in time. But today life is good enough. Anything that happens after today is just gravy. That’s what it’s like when you function as an adult. When you boil it all down, and get to the bottom line, nothing matters more… than to integrate with the child and adolescent inside, and take back the power from the ego. And to heal the inner parent, so it becomes an ally instead of a voice beating you down all the time. Life becomes much easier and a whole lot more fun when you resolve the inner conflict and integrate with the other voices inside you. You achieve your goals. Your ability increases. Whatever you want in the world comes within your grasp. Because you’re in touch with your power. A big part of what I do is help people integrate with themselves. If you want to jump in, let me know, and we’ll talk about it. We’ll talk about what you want, and how to get there. You see so many people in the world, who spend all their time giving their power away to the illusion they see around them. They don’t realize it’s just feedback. It’s a reflection of what’s inside. When you take the time to change what’s going on inside you, then your world can change with little or no effort on your part. You can prove it to yourself if you want to. If you really think about it, you probably already have. Just wanted to comment on your work. I find you have wisdom, wit and warmth. ego can happen more effectively when they come together as dream characters. figure out the dream language, let me know. I really appreciated what you had to say. Very insightful and you hit the nail on the head on several points. I was wondering about your reference on integrating your various parts though. Can you briefly describe the best way to do that? For those who were heavily programmed by parental figures, the meditation alone may not be enough, though. In my next article, I’ll go in to more detail about digging in deeper, especially as it relates to inner child and inner adolescent. That was really good, Mark. Very good food for thought. The degree to which you open up to and embrace the life energy that you use as raw material for your thoughts and feelings. Removing the gunk that clogs up and inhibits the flow of life energy moving through you. A fusion of thought and feeling that expands your consciousness.